Place an order for some piping hot fun with the Speedy Pizza play set. Launch your Hot Wheels® car zooming through the 360-degree loop for a delivery of high-octane excitement. The play set folds into a carrying case to take the fun on the road! 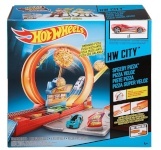 Connects to other Hot Wheels track sets (sold separately) for tons of fun. Includes one Hot Wheels vehicle. Each sold separately, subject to availability. Not for use with some Hot Wheels vehicles.